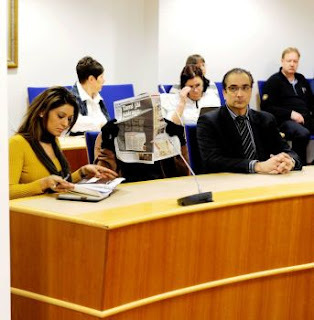 HONOR KILLING DESCRIBED IN FINNISH COURT AS BRUTAL RITUAL MURDER DURING SENTENCING……. – The Tundra Tabloids……. NOTE: This report in Finnish, states that he got life, or at least 11 yrs. A former spouse accused of killing an ethnic Pakistani woman (sitting in the middle behind the paper) will receive the verdict today. On the left is his translator, Riti Sandu, on the right his lawyer Heikki Lampela. The handling of the case that happened less than a year ago in Lappeenranta, will come to an end today in the South Karelia, district court. The last time the issue was discussed in the District Court was in April of last year. The convicted man was sent by a state at the time, to a mental facility for study. It is a story in which the victim, a 34-year old Pakistani woman was living in Finland. The killer was the woman’s ex-spouse, who also was born in Pakistan. They had been married during the years 2005-2007. In District Prosecutor Mark O. Ahonen’s view, it was very premeditated act of murder, a raw ritual slaughter. According to Defense lawyer, Heikki Lampela, it was just an act of murder. After the murder, the killer tried to escape from Finland, but the police arrested him at the Helsinki-Vantaa airport. Previous Post Previous Post LONE DANE PSYCHIATRIST PROVIDES ANALYTIC FOUNDATION FOR DEEMING OMAR KHADR TOO DANGEROUS FOR RELEASE……. Next Post Next Post BRITAIN IN DECLINE ALERT: MOHAMED NOW MORE POPULAR THAN JACK AND HARRY…….